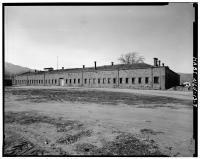 751. 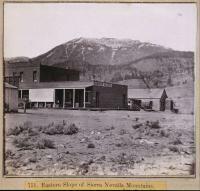 Eastern Slope of Sierra Nevada Mountains, From Washoe City. 750. 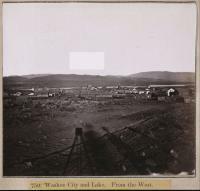 Washoe City and Lake. 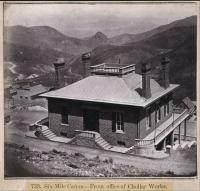 From the West. 749. 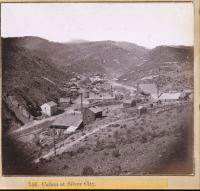 Silver City, from the Devil's Gate, looking North. 748. 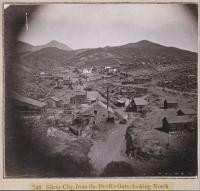 Silver City, from the Devil's Gate, looking South. 747. 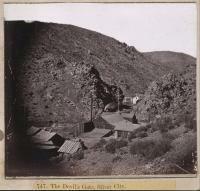 The Devil's Gate, Silver City. 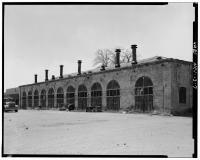 746. 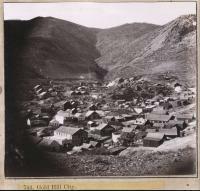 Canyon at Silver City. 745. 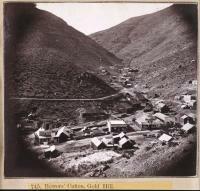 Bowers' Canyon, Gold Hill. 743. 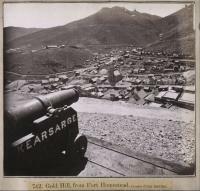 Gold Hill, from Fort Homestead, Bowers' Canyon. 742. 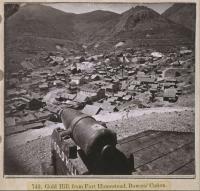 Gold Hill, from Fort Homestead, Crown Point Ravine. 741. 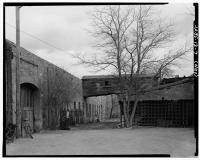 Fort Homestead, Gold Hill. 740. 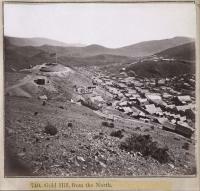 Gold Hill, from the North. 739. 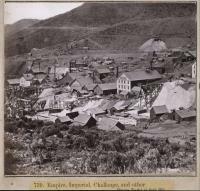 Empire, Imperial, Challenge, and other Mining Works at Gold Hill. 738. 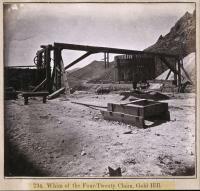 Quartz Mining Works at Gold Hill. 737. 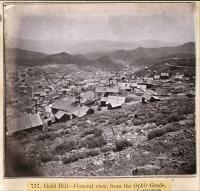 Gold Hill - General view, from the Ophir Grade, Looking South. 736. 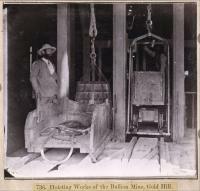 Hoisting Works of the Bullion Mine, Gold Hill. 735. 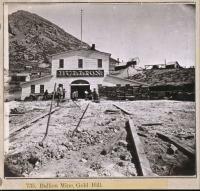 Bullion Mine, Gold Hill. 734. 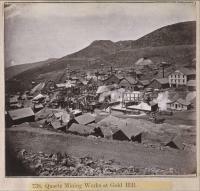 Whim of the Four-Twenty Claim, Gold Hill. 733. 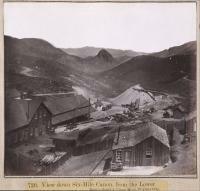 Six-Mile Canyon - From office of Chollar Works, Desert in the distance. 732. 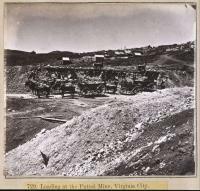 Chollar Mining Works, Virginia City. 731. 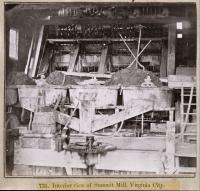 Interior view of Summit Mill, Virginia City. 730. 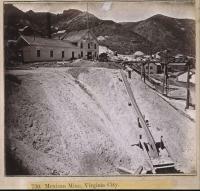 Mexican Mine, Virginia City. 729. 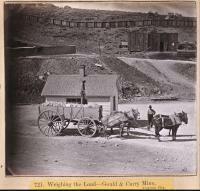 Loading at the Potosi Mine, Virginia City. 728. 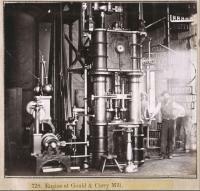 Engine at Gould & Curry Mill. 727. 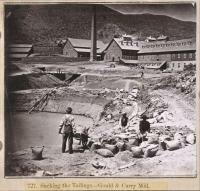 Sacking the Tailings - Gould & Curry Mill. 726. 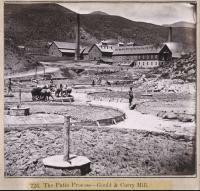 The Patio Process - Gould & Curry Mill. 725. 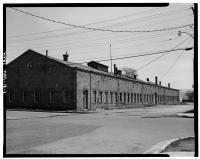 Gould & Curry Works, from the East. 724. 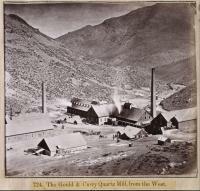 The Gould & Curry Quartz Mill, from the West. 723. 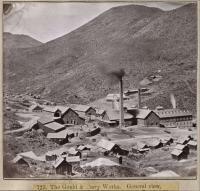 The Gould & Curry Works. 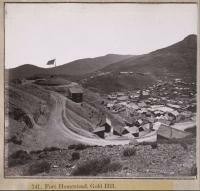 General view, From the South. 722. 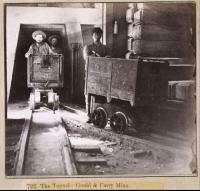 The Tunnel - Gould & Curry Mine. 721. 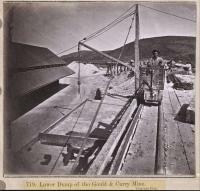 Weighing the Load - Gould & Curry Mine, Virginia City. 720. 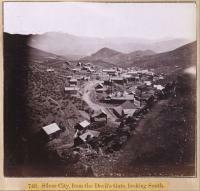 View down Six-Mile Canyon, from the Lower Dump, Gould & Curry Mine, Virginia City. 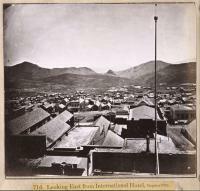 719. 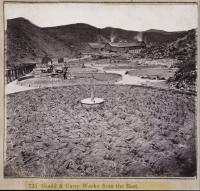 Lower Dump of the Gould & Curry Mine, Virginia City. 718. 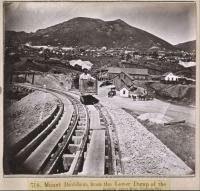 Mount Davidson, from the Lower Dump of the Gould & Curry Mine, Virginia City. 717. 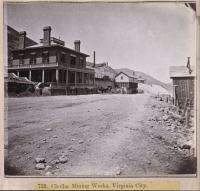 Six-Mile Canyon, from C Street, Virginia City. 716. 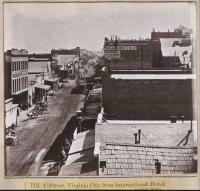 Looking East from International Hotel, Virginia City. 715. 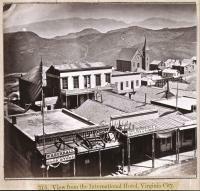 View from the International Hotel, Virginia City. 714. 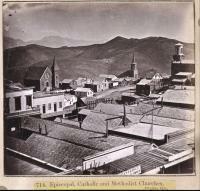 Episcopal, Catholic and Methodist Churches, Virginia City. 713. 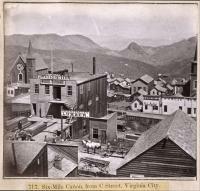 C Street, Virginia City, from International Hotel, Looking South. 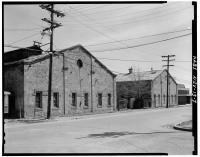 712. 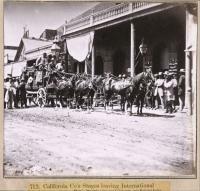 California Co's Stages leaving International Hotel, Virginia City, for California, via Donner Lake. 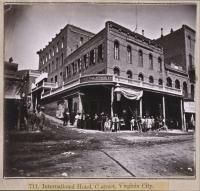 711. International Hotel, C street, Virginia City.